Vessel sinks have become one of the most popular interior design additions to bathrooms over the past few years, and companies all over the country are looking for the next hot style that will change the industry. According to the World Interior Design Network, Kohler and plumbing products provider Kallista have launched a series of four vessel sinks in various metallic designs. The new sinks, dubbed Obidos, Trinidad, Coimbra and Robert Kuo Wavelet, are designed in a clean-cut elliptical format and are constructed with features like a traditional marble look or satin bronze finishes. The sinks are designed with a deeper bowl to avoid splashing on the surface of a bathroom vanity and can suit styles ranging from rustic to industrial. Perhaps the most stunning of the new sinks is the Robert Kuo Wavelet, which is hammered from a solid piece of copper combined with a relief of sheet metal. This offers significant light refraction and can add to the warmth and overall feel of a bathroom. These new sinks are just a few of the fabulous styles that are on the market right now. 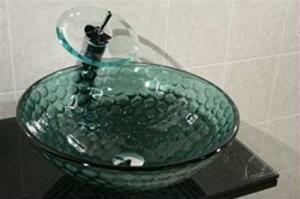 Which vessel sink would help to jazz up the look of your bathroom's aesthetic?